Friends of mine asked me to create a Night Sister costume, specifically that of Sai Sircu. They already had that costume, but it was made from way-too-shiny polyester satin, unstabilized so all parts were sort of floppy, and were therefore not happy with it; but they still loved the character, so a new costume with better materials was what they asked for. I started by selecting fabric. The fabric that’s actually shown in the illustration seems to have a slight sheen, but is not shiny – in other words, more like what real word taffetta would be opposed to satin. It also seems sort of stiff – again, more like taffeta than satin. I chose a double-sided (one side woven colored, the other side is woven black), therefore iridescent Duchesse Satin. Don’t be confused by the name; double-sided Duchesse satin has way more in common with taffeta than with satin, drape- and sheen- wise. Color swatches for the costume – we chose “Apple” (small swatch to the left) and Midnight Blue (large swatch to the right), as, compared to the illustration, those colors seemed to fit best. 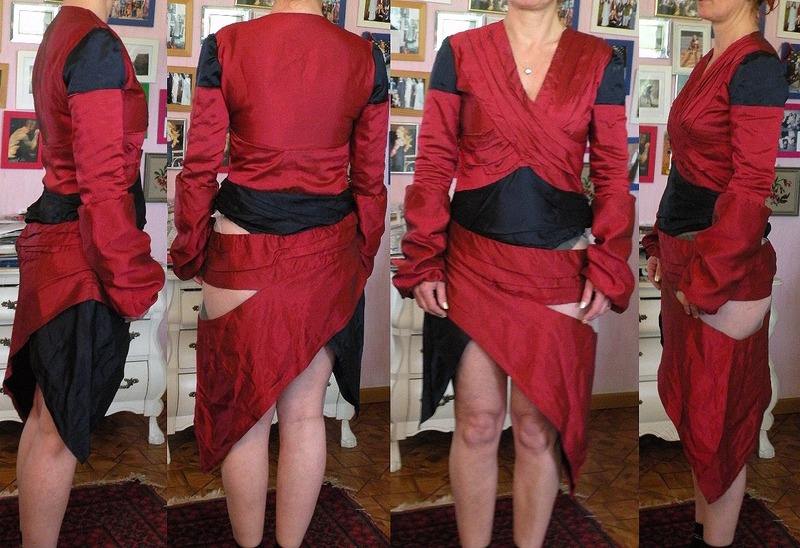 I started by draping a mockup for the base dress over my dress mannequin, then sketched down the precise placement of the draped fabric pieces on that mockup. 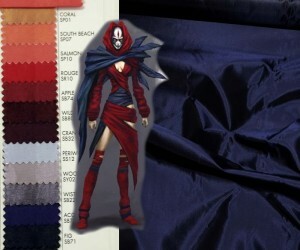 That helped a lot with the placement for the pleated, draped fabric pieces. The draped mockup on my dress mannequin, with the placement of the draped panels sketched down to it. 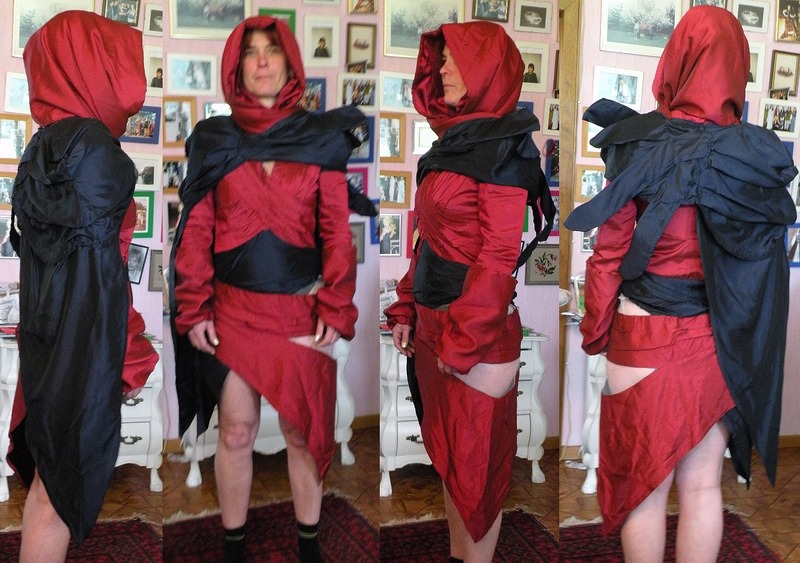 One problem I faced were the “loose” panels which wrap around the hip. Without any kind of stabilizer, those would just “flop down” and, with gravity and movements, started to move and wrap all weird around the body – which doesn’t only look bad but can become quite uncomfortable. 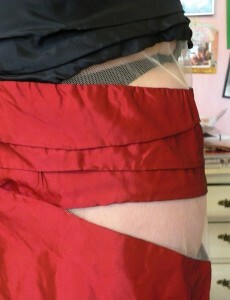 My solution was to sew an almost invisible layer of ivory tulle behind the openings between those panels. As you can probably see, you can only see, or rather “guess” the tulle if you are REALLY close (as close as next to no one ever gets to a costume – the regular viewing distance is approximately ten feet); EXCEPT if you wear dark underwear beneath it. That, however, isn’t supposed to happen – the costume has to be worn with opaque tights or leggings; a-bit-lighter-than-skin-colored. The tulle really just helps to keep those draped panels where they are supposed to be, all the time, so the person wearing the costume doesn’t have to worry about them. Similarly, dance costumes are “held in place” if the actual fabric that you can see just seems to be in places where it could never, ever “hold” the fabric to the body. 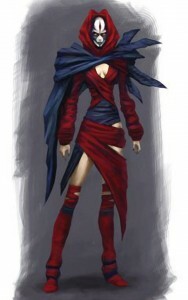 The wrapping of the colored pieces of fabric around the body is really, more or less, intuitive. You know, if the front wraps like “this”, the back can only wrap in certain ways. It did help a lot to look at the way fabric wrapped around the body of other Night Sisters, though. From the intuitive way in combination with the way the fabric wraps on other Night Sisters, I developed the wrapping pattern for this costume. 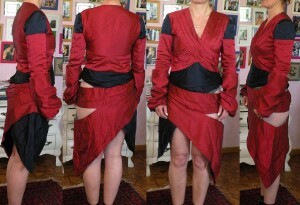 This picture shows the wrapped dress from all sides. Again, as you can probably see, the tulle which stabilizes the side bottom draped panels is basically invisible. The draped panels are securely stitched to a solid base dress using invisible hand stitching. 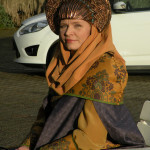 That makes sure that the draped panels will stay in place, no matter what happens. The base dress closes at the side with a zipper. The “cape” and “spikes” part was interesting to create. I basically created a one-sided shoulder cloak, pleated at the shoulder; then added the “spike” parts to it. They are stabilized with hat wire; so they’re not too stiff and can bend to be packed down, but are also lightweight. They also move with wind and body motion. For the boots, I glued and sewed the Duchesse satin over a base of flat, overknee boots. That, combined with straps of fabric with a piece of rubber on the inside to prevent them from slipping, creates the illusion of “leg wraps”.